Caster Control Pulpit for the Stainless Melting & Continuous Casting facility operated by the UK based Long Products Division of the worlds leading stainless steel producer. 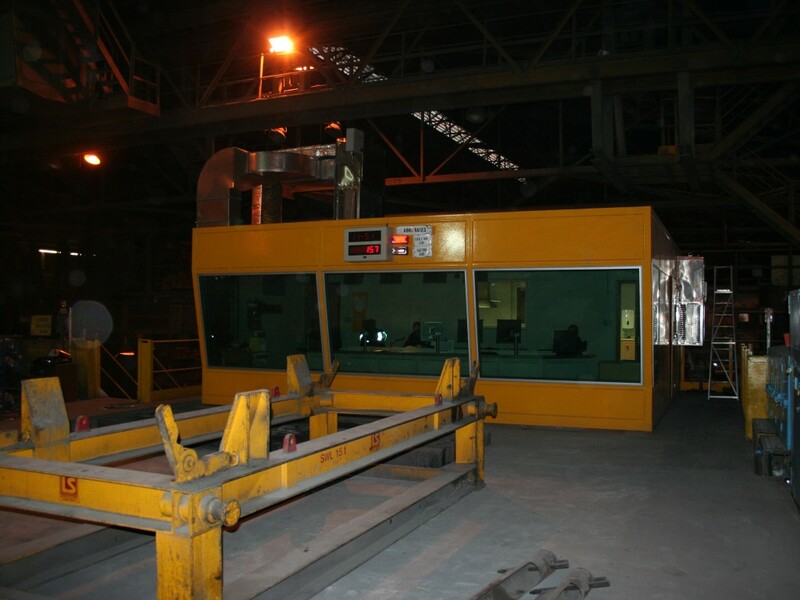 To survey, design, manufacture, deliver, install and commission the required facilities, these consisting of an upper level control room and amenities area of approximate overall sizes 7.5m long x 6.9m wide x 3.0m high, and a lower level electrical room of approximate overall sizes 5.8m long x 2.8m wide x 3.7m high. Supporting structural steelwork to integrate with the existing mill structures, crane stanchions etc., including gantry structures with multilevel access via numerous industrial grade stairwells & platforms to provide safe routes of access and exit / emergency exit – all designed in accordance with structural calculations provided by independent civil & structural consulting engineers. The entire facility to be suitable for operation in the noisy, dirty & dusty conditions of this heavy industrial process, and fit for purpose in providing a safe working environment for operations and maintenance personnel – constructed in modular form, with each individual module being purposely designed & sized for ease of transportation and installation on site. Upper Level Control Room & Amenities Area to have internal partitioning forming an entrance lobby, control room, a fully-equipped kitchen & dining area, and a toilet & wash-room facility, whilst the Lower Level Electrical Switchroom provided the housed equipment with suitable protection against dust, dirt and the harmful effects of condensation, corrosion etc. Being in an elevated position, the acoustically insulated vision panels (manufactured in tinted, heat reflective safety glass & inclined to prevent the build up of dust & dirt on the panes) allow operational personnel to oversee the production areas whilst offering protection from furnace glare. To ensure the total comfort of personnel and the satisfactory operation of all electrical equipment, a forced fresh air supply was provided working in conjunction with an industrial air conditioning unit. The turnkey package included the provision of suspended ceilings, modular & emergency lighting, mains power, data transfer, fire detection & alarm systems, plumbing services and finished vinyl tile flooring etc. Rigid manufacturing programme and a limited installation schedule to coincide with the end users two-week summer shut-down period. The construction provided a 30dB reduction from factory ambient noise levels, and room-to-room noise, allowing personnel to effectively communicate in a stress-free, comfortable environment.